♦ Currently available drug treatments provide symptomatic benefit; none is proven as neuroprotective. ♦ Treatment is initiated when required from a functional viewpoint (this is variable between patients, and the decision requires patient and often carer input). ♦ Treatment is started at a variable point after the onset of symptoms (note symptom onset usually predates diagnosis). ♦ There are several initial treatment choices, each with advantages and disadvantages. 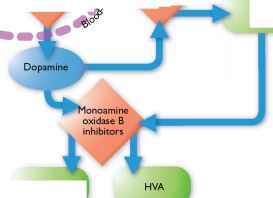 The main choices are levodopa (with decarboxylase inhibitor), dopamine agonists (DAs), and monoamine oxidase B inhibitors (MAOB-Is). Anticholinergics and amantadine are sometimes used (but anticholinergics are generally better avoided as they may contribute to cognitive impairment, and can be difficult to withdraw because of rebound tremor). Drug choice is patient-specific depending on co-morbidities, biological age, and patient choice. Several randomized clinical trials compare drug classes, e.g. levodopa versus DAs, MAOB-Is versus placebo. ♦ PD is not a 'static' illness. Therefore, medications need to be titrated over time. 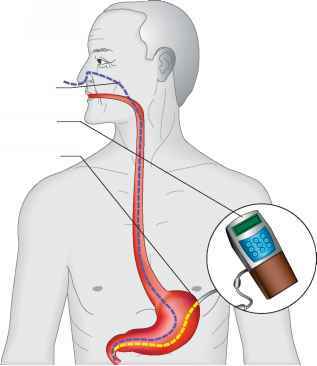 ♦ In general, it is best to find the lowest dosage of any PD medication that will provide functional improvement. ♦ Not all motor symptoms of PD respond uniformly to pharmacological treatment. Bradykinesia and rigidity are most responsive to medications; postural instability is the least responsive to treatment; and pharmacological response to tremor is variable. Signs of disease progression are increasing slowness, stiffness, and worsening tremor. Initial low-dose therapy with DA or levodopa is generally increased gradually for worsening symptoms and levels of function. Once initial therapy reaches the recommended maximum dose or maximally tolerated level, and addition of a second agent is required, a drug from a different class will become appropriate. Dopaminergic excess is characterized by confusion, hallucinations and involuntary movement (dyskinesia). Reduction of the dopaminergic therapy lowers such side-effects, but many patients prefer to tolerate mild visual hallucinations or dyskinesia as they find 'off periods unpleasant and sometimes painful. Excessive sleep is common to all dopaminergic therapy and is dose related, and appropriate caution when driving or operating machinery is needed. Note: Most of the drug treatments described in this book are available internationally. Where a formulation is specific to either the USA or Europe, this is noted. 57 Levodopa and PD. 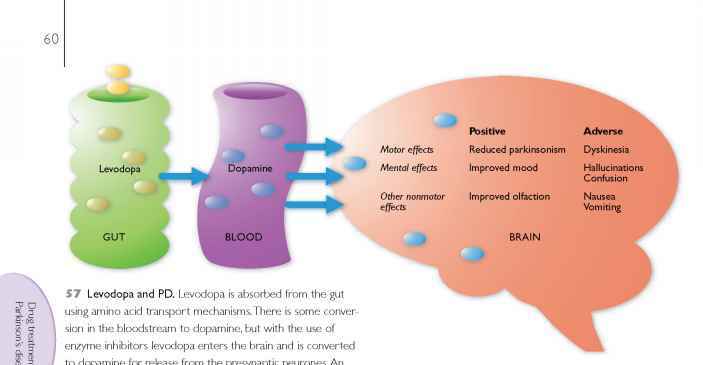 Levodopa is absorbed from the gut using amino acid transport mechanisms.There is some conversion in the bloodstream to dopamine, but with the use of enzyme inhibitors levodopa enters the brain and is converted to dopamine for release from the presynaptic neurones. An overview of some effects of levodopa is shown. 58 Levodopa metabolism and enzyme inhibitors. The pathway for metabolism of levodopa to dopamine and its breakdown products (green) is shown: enzyme inhibitors (orange) function at three sites. Dopamine decarboxylase inhibitors work outside the blood-brain barrier and therefore promote the entry of levodopa to the brain for conversion to dopamine.The other enzyme inhibitors also supplement the effect of dopamine.The MAOB-Is function both on intrinsic dopamine and extrinsic levodopa.The COMT inhibitors function primarily as extenders to the duration of action of levodopa with much less effect on intrinsic dopamine. Levodopa (57) is a naturally occurring amino acid found in seedlings, pods, and broad (fava) beans. It was first introduced in the early 1970s and was a major therapeutic advance. Initially very high doses were given, and peripheral metabolism to dopamine caused intolerable nausea, dizziness, and postural hypotension, limiting its use. The discovery of peripheral decarboxylase inhibitors (carbidopa and benserazide) led to combined products of levodopa with decarboxy-lase inhibitors which dramatically alleviated adverse peripheral dopaminergic effects (58). Levodopa is currently the most effective treatment for parkinsonian symptom control and remains the 'gold standard'. Levodopa is available in many forms and formulations (59). Similar preparation names containing different amounts of active ingredients necessitate care by prescribers. At least 70 mg per day of the carbidopa is necessary to completely block peripheral decarboxylation (smaller doses have increased side-effects). The dosing is typically initiated at one 25/100 mg carbidopa/levodopa, referred to generically as co-careldopa, and by brand as Sinemet (or benserazide/levodopa, referred to generically as co-beneldopa, and by brand as Madopar) tablet three times daily and increased as necessary until clinical response is achieved. 59 Levodopa formulations. Levodopa is available in a range of dosages and tablet types. ♦ The dose of active levodopa is often used to calculate or refer to the total daily dose (e.g. 25/100 x 3 tablets per day = 300 mg levodopa). ♦ Smaller starting doses (e.g. 100 or 150 mg levodopa per day) are sometimes used in the UK (e.g. elderly patients with co-morbid illness, patients with psychiatric history), although this gives insufficient decarboxylase inhibitor. ♦ The recommended maximum dose of levodopa per day is 2000 mg.
♦ The main problems with levodopa result from a short half-life (90 minutes), which leads to peaks and troughs in serum (and therefore brain) levodopa levels (60) causing pulsatile rather than the more physiological continuous dopaminergic stimulation (61). 60 Fluctuations in levodopa levels. A dosing schedule results in peaks and troughs of serum and brain levodopa levels.The initial dose of levodopa in the morning may be associated with a 'delayed on' phenomenon (green arrow)until the medication begins to work. If the level exceeds the therapeutic window for an effective dopamine level, there may be associated involuntary movement referred to as peak dose dyskinesia (purple arrows). 61 Normal dopamine flow. 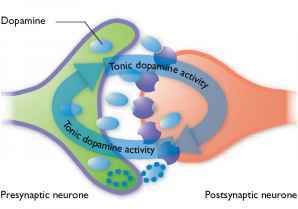 Dopamine is normally released constantly which creates a steady state between the pre- and postsynaptic neurones.This state is affected by PD where episodic delivery of medication results in changes at the postsynaptic receptor contributing to the development of motor fluctuations. The controlled-release (CR) preparations were developed to prolong the duration of action and provide smoother control and lessen the development of motor complications. O Sinemet CR is designed to release active ingredients over a 4-6-hr period via a slowly dissolving polymeric matrix and has approximately 70% bioavailability compared to standard (immediate) release. Dosage and dosing interval can be increased by up to 30%. O Madopar CR is transformed in the stomach to a mucoid body which delivers its content through a hydrated layer by diffusion. Lower bioavailability means that a 30% increase in dosing is sometimes recommended for CR preparations. In practice, patients are generally not guided to switch all their tablets from standard-release over to CR, or vice versa, as this is not helpful and the altered bioavailability will upset symptom control. In calculating the total dose per day, 100 mg of a CR preparation can be considered approximately equal to 70 mg. In clinical trials there was no difference in the development of motor fluctuations between immediate and CR preparations. The CR levodopa preparations may be subject to more variable gut absorption than immediate-release preparations, which can contribute to fluctuations in advanced disease. CR levodopa has a place as a nocturnal dose to help reduce overnight symptoms (DAs also have this role due to their longer half-life). Parcopa is an immediate-release, rapidly dissolving oral carbidopa/levodopa preparation available in the doses of immediate-release carbidopa/levodopa. It dissolves in the mouth without requiring water. However, its absorption is still intestinal and therefore the time to peak concentration is generally not faster than immediate-release carbidopa/levodopa. Occasionally, the immediate-release form is used to make a liquid preparation for PD patients with significant motor fluctuations by mixing 10 tablets of 25/100 mg carbidopa/levodopa with !/2 teaspoon of ascorbic acid crystals and 1000 mL of distilled water. This preparation allows small and frequent dosing with the goal of relieving wearing-off symptoms without causing or worsening peak-dose dyskinesia. Abrupt discontinuation of levodopa should be avoided to prevent precipitation of a neuroleptic malignant-like syndrome characterized by rigidity, hyperthermia, altered consciousness, tachycardia, diaphoresis, and elevated creatine kinase.